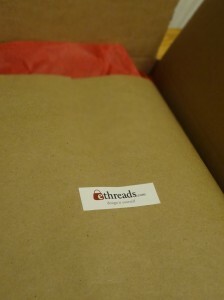 When you place an order with eThreads, it is reviewed and printed onto a little slip of paper with your name, date of order and bag specifics like fabric, zipper and lining colors. We even check if you wanted the fabric rotated or if the bag is for a lefty, because that changes how we make the bag. That little slip gets pinned to your bag at every step. After the bag is cut, pressed, sewn, pressed, and quality checked, we remove the little slip and wrap up the bag. We write a personalized note, tuck it into the bag, and wrap the whole package in recycled red tissue paper, brown paper and brown packaging. I imagine the next person who opens the box is meeting their bag for the first time and that moment makes me smile. This entry was posted in Testimonials and tagged Testimonials. Bookmark the permalink. Follow any comments here with the RSS feed for this post.